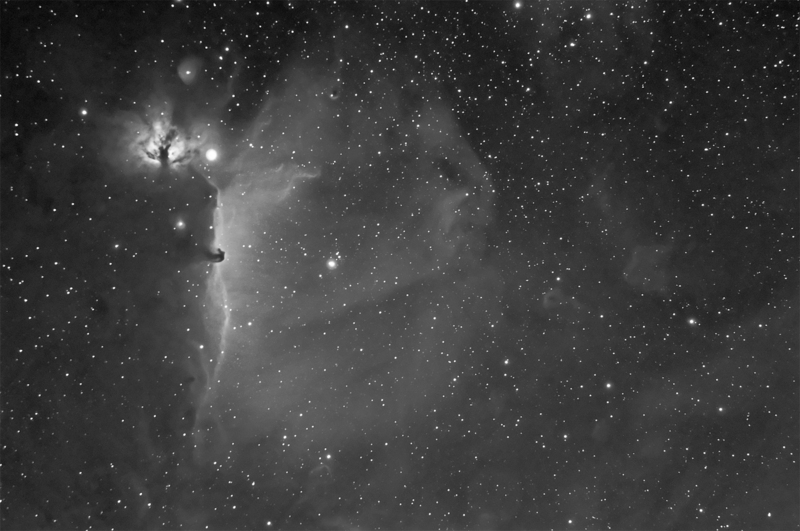 After reading about MartinB’s method for combining Ha into/onto RGB data for his Cone nebula image a while back, I was itching to have a play with some of my own data. Erik Larsen has very nicely allowed me to use his RGB data in this combined image, and to post the results. 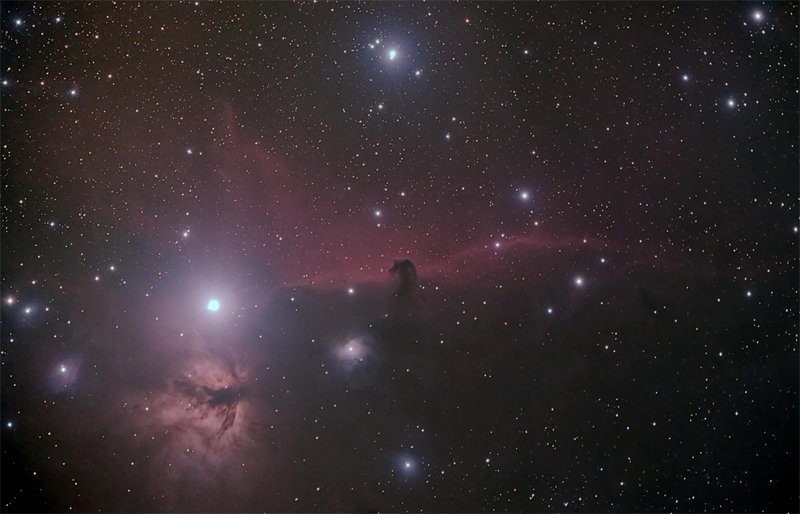 His data was 11x300s, taken with a modded Canon 500D through an Orion ED80. Many thanks for allowing me to show this. Threw them both into Registar, aligned the Ha data to the RGB data, saved them out. Now using MartinB’s method, I load the RGB data into a layer, then duplicated that RGB layer on top with “soft light” mode. This increases the contrast, but also drops the black point, so I used some levels/curves to bring that back up a little. I then pasted the greyscale Ha data into a layer on top, set the green and blue channels to black (only the red was left), then set that layer method to “lighten” to it only affected the reds. This is the result. Lots of lovely reds, but no loss of contrast like previous attempts of using just an additiona Ha layer, plus the other colours are not washed out. I am currently digging out all my previos Ha RGB images to see if I can improve on them with the same method. 95 days… ninety five long frustrating days… thats how long it was without an image. And then, on Christmas day, the skies cleared. It was glorious, and I have the imaging buzz again! Woohoo! 80+ days now without any imaging is making me a bit crazy, so I decided to dig out some old data and see what I could do with it. I had forgotten about all the strange things that the Hyperstar did to my images, includuding being flipped horitonally (caused Registar to fail!) and slightly bloaty stars. Looking at this RGB data again now (nearly 2 years later), I can see some real issues with it. 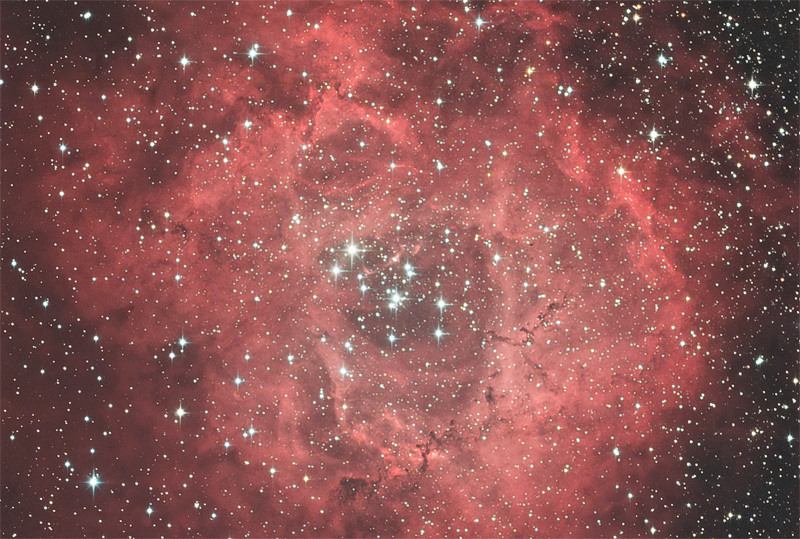 Hopefully I`ll get a chance to shoot some RGB data of the Rosette this winter with my Borg 77…. actually, at the current rate of bad weather, I`ll be happy if I manage to image anything at all before summer comes around again! I`d just like to say that I have looked at this image on several different monitors, and it varies wildly from rich reds to light salmon pinks, so I just worked on it with my calibrated monitors for what I see as my own personal choice. Your own opinion of the colour will vary depending on how your monitor shows it. I`d also like to thank MartinB for allowing me to use his Ha data for this project, it really helped add some punch to this image. 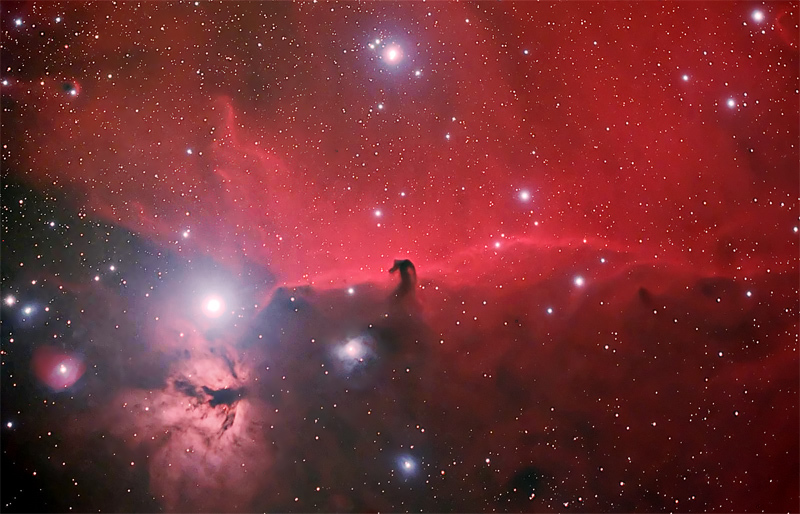 Aligned with Registar, post process with PixInsight and PSCS2.